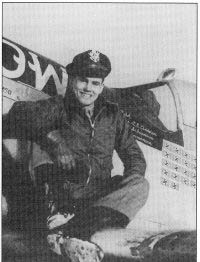 Ace: Clarence E. “Bud” Anderson Jr.
California native Clarence Emil “Bud” Anderson Jr., born 13 January 1922 in Oakland, CA attended Sacramento Junior College before joining the U.S. Army Air Forces on 19 January 1942. Following commissioning and graduation from the Aviation Cadet program on 29 September 1942, Lieutenant Anderson was subsequently assigned to the 363rd Fighter Squadron, 357th Fighter Group. After training in P-39s, the Group was sent to England in November 1943 and equipped with the new P-51. Anderson, by then a captain, participated in the 357th’s first combat on 20 February 1943, damaging an Me-109 north of Dessau. He scored his first victory, another ‘109 downed 30 miles northwest of Hanover, on 8 March, and on 11 April was credited with destroying one Me-109, damaging another, and a one-quarter share of a Heinkel 111K west of Hanover. He shot down an Fw-190 30 miles southeast of Orleans, France on 30 April and became an ace on 8 May, downing another ‘190 near Soltau. Following a brief rest tour in the States, Captain Anderson returned to combat with the 363rd, downing two Fw-190s, and was credited with a third ‘190 as a probable on 27 November. He scored his last a week later, credited with two more Fw-190s and another probable on 5 December. “Bud” Anderson remained in the Air Force following the War and commanded an F-86 squadron during the Korean War. During the Vietnam War he commanded the 355th Tactical Fighter Wing, logging combat time in the F-105. He retired from the Air Force on 1 March 1972 and subsequently went to work for McDonnell-Douglas Aircraft Corporation as manager of their flight test facility at Edwards AFB, CA.